DEZAUCHE / L'ISLE - Alexandri Magni Imperium et Expeditio..
DEZAUCHE / L'ISLE,G - Alexandri Magni Imperium et Expeditio..
Map maker : DEZAUCHE / L'ISLE,G. Size : 18.2 x 32.3 inches. / 46.2 x 82.0 cm. 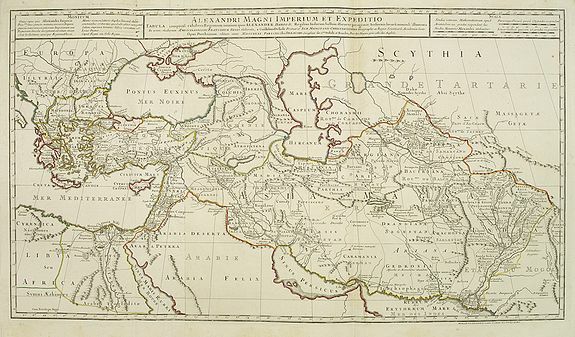 Description :Uncommon map of the Empire and travels of Alexander the Great. . The map is printed from two sheets. Condition : Paper slightly age toned and spotted. General good condition.